The U.S. Occupational Safety and Health Administration (OSHA) has guidelines, precautions, and instructions in regards to workplace emergencies and evacuations. Their e-book, How to Plan for Workplace Emergencies and Evacuations, remains one of the most widely referenced and cited publications for warehouse preparedness. In addition to OSHA rules and regulations, training is essential to being prepared in the event of an emergency at the workplace, particularly warehouses. That’s where CertifyMeOnline.net helps – we’re the preferred training partner for aerial lifts and scissor lifts all across the United States. With so much cargo, equipment, and employees to account for, having a plan in place allows everyone from site supervisors to scissor lift operators to act with purpose during emergencies. Proper training lessens chaos and confusion, which are considered “fuel to the fire” during crisis events. If your company doesn’t have a clear set of defined emergency plans, the time to acquire them is yesterday. The safety experts here at CertifyMeOnline.net put together this resource in order to promote awareness for preparedness. In conjunction with our aerial work platform (AWP) training programs, we recommend having an emergency preparedness plan for your workplace. What’s more, emergency scenarios continue to evolve and develop. Sure, emergency plans should always include events like tornadoes and floods. But did anyone think workplace shootings and other related violence would be such a relatively common problem? Categorize your warehouse emergency plans. For example, you can use severe weather, fire, workplace violence, and medical emergencies to streamline how your warehouse personnel deals with each situation. As stated earlier, you don’t want details and micro-management to derail your safety program. Stick with 4-8 sub-categories and go from there! When in doubt, err on the side of OSHA. The blueprint for warehouse emergency plans already exists. Feel free to reference OSHA’s How to Plan for Workplace Emergencies and Evacuations for tips & tricks on getting safety/emergency plans that fit your particular warehouse. Every workplace is different, but OSHA’s guidelines apply everywhere. Specific methods for reporting fires, natural disasters and other emergencies. “Drill” down your emergency response policy. Smart, sound safety practices during emergencies doesn’t happen by accident. 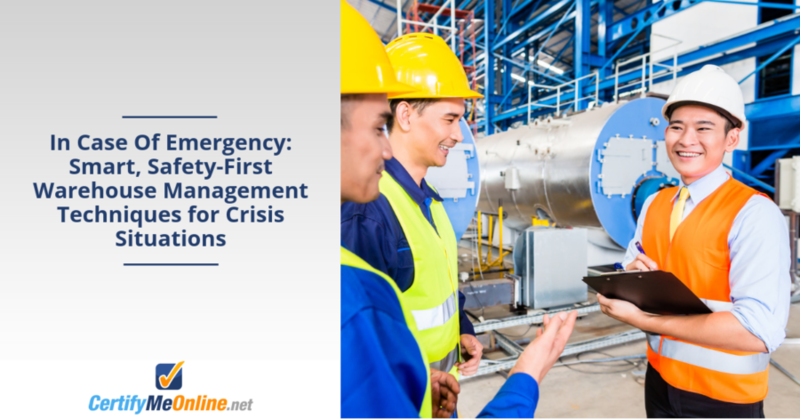 Only by going through safety drills and other emergency response simulations will your company embrace – and promote – the best possible outcomes. Schedule regularly scheduled and random emergency response drills, and make sure to log the results. Always compare this data to see if your warehouse emergency plans and warehouse preparedness plan is regressing. If so, address the deficiencies to improve your safety plan. You never know when a real emergency will happen; in the meantime, it’s always best to implement safety drills to optimize warehouse safety. Along with Emergency Plans, Aerial Lift & Scissor Lift Training is a Safety Essential! CertifyMeOnline.net offers OSHA compliant training courses for all of your aerial lift, scissor lift, and AWP employees. Aside from unexpected emergencies, workplace accidents are the biggest threat to safety. And the lack of training is usually to blame. It’s illegal for your company to use aerial lift or scissor lift workers who lack the proper OSHA equipment operating credentials. CertifyMeOnline.net is a trusted training source for your complete AWP training and compliance needs. With an affordable, online accessible selection of training courses, we’ll get your workers trained and compliant in less time – and for much less cost – than you think. Our OSHA approved training courses are, indirectly, your own set of emergency plans. That’s because aerial lift and scissor lift accident emergencies are prevented with comprehensive training. Give your employees the training they deserve – and the extra peace of mind for your management team – with our aerial lift and scissor lift training today. Register your company with CertifyMeOnline.net, and see how our OSHA compliant instruction benefits your overall safety plan. It’s the best investment in safety for today, and the future. Thanks for considering CertifyMeOnline.net for your complete aerial lift and scissor lift training requirements! ← How Many Miles Does an Average Forklift Travel in a Year?